One of the problems our elderly face is the loss of bladder control or incontinence. 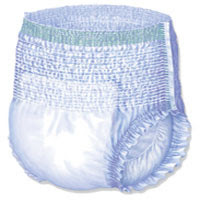 Good thing that we now have the adult diaper. It is more absorbent than the regular cloth underwear, and thus, keep the person drier with less irritability on the skin. It is thicker but comfortable, biodegrable and, therefore, can easily be disposed of, and most of all, cost-efficient.